Eddie Adams, a native of Snow Hill, NC, is a graduate of Appalachian State University in Boone, NC where he obtained degrees in Music Education and Music Performance. His primary teachers were Dr. Stephen Hopkins (conducting) and Dr. Joseph Amaya (voice). Mr. Adams completed a Masters Degree in Choral Conducting at East Carolina University under the tutelage of Dr. Dan Bara (conducting) and Dr. Louise Toppin (voice) Mr. Adams currently serves as the director of choral activities at Millbrook High School in Raleigh where he conducts the school’s four choirs, prepares the vocalists for the annual spring musical, teaches AP Music Theory, and facilitates the International Baccalaureate Diploma Program for music. In addition to working at Millbrook H.S., he is the director of music at St. Giles Presbyterian Church in Raleigh, NC. Mr. Adams is also an active clinician, having worked with choirs throughout North Carolina. 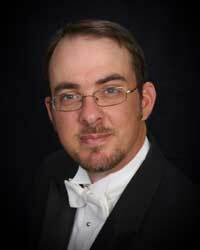 He is a member of the Music Educators of North Carolina and the American Choral Directors Association. Brenda Fernandez received the Bachelor of Music in Piano Performance from the Cincinnati Conservatory of Music in Ohio and the Master of Music in Accompanying from Manhattan School of Music in NYC. She has performed throughout the Caribbean as a soloist and accompanist and as an accompanist throughout the US, Canada and Europe. Locally Ms. Fernandez has accompanied with the North Carolina Opera, UNCG Summer Music Camps, numerous high schools, and for local and statewide competitions and college auditions. Currently she is the accompanist for the Meredith College Choirs, Capital City Girls Choir, Millbrook High School Chorus, Southeast Raleigh High School Chorus and in Wilson with the Hunt High School Chorus. Ms. Fernandez also has a private piano studio and teaches private piano lessons at Ravenscroft School. She is a former K-6 general music teacher and 7-12 choral director. Ms. Fernandez is a highly sought after accompanist and adjudicator in the Triangle area. She is a member of the Raleigh Piano Teachers Association, North Carolina Music Teachers Association and Music Teachers National Association.